INFINI combines fractional radiofrequency with microneedling technologies. There are many radiofrequency devices that treat the skin from the outside in; however, INFINI uses flow needle technology to deliver the radiofrequency current instead only to the deeper level of the skin where it is needed – the dermis – and not to the superficial level of the skin – the epidermis – which could be injured by the radiofrequency strength. The dermis, the second layer of skin, contains collagen – the supporting structure of our skin. INFINI delivers heat energy via RF to the dermis, thus creating multiple mini-coagulation zones at the dermal layer – precise and specific injuries – which then encourages collagen re-growth and tissue tightening exactly at the depth needed in the skin. Radiofrequency (RF) energy is compared to radio waves because they both occur at the same frequency. However, RF is in fact electrical energy. RF devices used in the skin deliver electrical energy into the skin/collagen (collagen makes up 80% of skin), heating the targeted area. Collagen in the skin is affected by age in various ways. Skin becomes thinner and drier, and develops sags and wrinkles due to the collagen and elastin (one of the other components of skin) becoming increasingly disconnected. Growth of new skin cells slows down dramatically. All skin rejuvenation devices create a specific type of injury in the skin, which then signals the otherwise sluggish, slow-reproducing collagen to suddenly ramp up its new collagen production. Collagen typically needs to face a heat source – light (like IPL), laser (like Fraxel), or electrical energy (like RF), to be stimulated to produce new collagen. RF technologies used in the skin are divided into subcategories. The “polarity” of the device is described as being either monopolar, bipolar, or multipolar. INFINI is multipolar, which means it’s a polar device with multiple paired needle electrodes. RF devices can also be classified by how they affect the skin. Traditional categories have been non-ablative, sublative, and ablative, depending on whether the RF technology injures the top layers of the skin. INIFINI is in a category of its own as it delivers multi-dimensional energy in many layers of the dermis. Finally, some RF devices are fractional, including INFINI. Fractionated devices deliver many discrete zones of energy delivery, rather than a single large treatment stamp. Fractionated devices, RF or carbon dioxide lasers allow skin following treatment to heal faster. Microneedling uses extremely small sterilized needles on the skin, and traditional microneedling is not associated with a light or energy device. The INFINI hand piece contains 49 microscopic needles that are deployed through the skin’s surface. Once deployed, the INFINI micro needle tips conduct radiofrequency energy into predetermined depths of the dermis, a huge advantage over traditional micro needling devices. Loose skin (laxity) and wrinkles are commonly treated with INFINI to achieve tissue tightening, collagen formation, re-volumization of tissues, and improvement of skin texture. 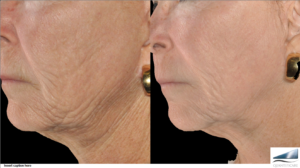 Not only is INFINI beneficial for skin wrinkles and skin tightening, but also for scar remodeling. Traumatic scars and most types of acne scars respond well to a series of INFINI treatments. The face is the most common area of treatment, in order to correct wrinkles, scars or skin texture. However, neck aging and crepey skin respond well to INFINI treatment. Vertical wrinkles of the decolletage area can be treated with INFINI for chest rejuvenation. INFINI is safe for all skin types. With INFINI, RF energy from the device bypasses the skin’s surface layer (epidermis) and is delivered directly to the lower, collagen-producing dermis. Since the top layer of the skin is not treated, the risk of post-treatment pigmentation is greatly reduced. INFINI is approved for treatment of ALL skin types, and is an ideal option for Hispanic, Asian and African American patients who are not good candidates for laser procedures due to the risk of pigmentary problems. INFINI can be uncomfortable. A topical numbing ointment (a mixture of lidocaine and tetracaine) is applied 1-1/2-2 hours prior to the procedure. According to a large study of almost 500 patients on three continents, INFINI patients reported discomfort as mild in nature and similar to a mild sting or snap. Side effects are quite mild in nature, making this a minimal downtime treatment. For patients with very vascular skin, there may be mild pinpoint bleeding and a very small chance of bruise. Because there is a chance of bruising with any mildly invasive skin treatment, we advise patients to refrain from taking aspirin, ibuprofen, acetaminophen, naproxen, Vitamin E and Fish Oil for at least 1 week prior to treatment. The most common side effect is that the skin is mildly red (a “windburn” look) for approximately 24 hours. The skin may feel slightly rough like sandpaper for 2-3 days. Many patients can resume their normal routine within a day.